Whether it’s the middle of a hot and humid summer or deep into the cold months of winter, seasonal allergies can strike at any time leaving us coughing, wheezing and otherwise feeling lousy. While many people opt to run to the nearest pharmacy to grab the allergy meds that are always fully stocked and ready for use. Many of these medications, whether prescribed or obtained over the counter can leave us with irritating side effects ranging from dizziness or drowsiness to upset stomach and more. There are natural alternatives to those drugstore buys that can help alleviate the symptoms of allergies and keep you breathing freely without the upset stomach, drowsiness and other medicinally induced side effects that come with pharmaceutical medications. There are many natural remedies including herbs and teas that you can try for your seasonal allergy symptoms that can possibly help relieve the irritations in a safer manner than some pharmaceutical options. Before you run off to the woods to start collecting herbs to treat your seasonal allergies, be sure to plan ahead so you know which herbs you need. Be sure to take along a good pair of rugged nitrile gloves to wear so you won’t chance pulling up poison ivy or other plants you don’t want to mess with while scouting for your herbs. Or better yet, plant an herb garden in your kitchen and you will have all of nature’s natural healing powers right at your fingertips all year long to help keep your body and mind well year-round. Garlic– Garlic is such a great herb and not only for Italian cooking! It can be used to help keep inflammation down and since it contains the pigment quercetin, it is great at fighting symptoms associated with those pesky spring allergies that cause stuffy noses and breathing difficulty. As a matter of fact, garlic has been used for allergies as well as helping to lower blood pressure, keep bad cholesterol at bay and lower the risk of coronary heart disease. It is, in essence, a wonder herb that helps many ailments. Turmeric- If you enjoy a good meal from Thailand, you have no doubt had a taste of Turmeric. This herb has healing powers that can combat the symptoms of allergic rhinitis by helping clear the nasal passages. Horehound- This herb is from the bitter mint family of herbs and has long been used as an ingredient in cough drops. Horehound can help move congestion from the body, thus alleviating coughs and post nasal drip. Nettle- You need to get to Nettle before it flowers for a fuller effect of the herb. It’s best to freeze dry nettle before using it for allergies. Butterbur- Butterbur is often one of the most recommended herbs to use for allergy relief. It has been known to treat migraines, asthma and seasonal allergy symptoms and is widely used in homes throughout Europe. The benefits of Butterbur have been compared to prescription medications including Allegra and Zyrtec. Many people toss their herbs into a cup of tea while others choose to add them to a meal. Speaking of tea, if you are already a tea lover, you will love to know that there are many teas that can be used to relieve the symptoms of allergies. Peppermint Teas- Peppermint helps decrease secretions and open breathing passages. Whether you use it in a tea or even by itself, peppermint is a great remedy for stuffy noses, coughing, and inflamed throats. Green Tea- Packed with powerful antioxidants, green tea is a great anti-inflammatory that can be used to protect a body from allergens including pollen, dust and even animal hair! If you love animals and the outdoors but sneeze when you are near either, you may want to try a big cup of green tea! Rooibos Tea- Rooibos helps block the release of histamines which in turn keeps allergy symptoms at bay. Roovios teas contain bioflavonoids which help boost blood circulation and treat allergies. Bioflavonoids are also great for alleviating arthritis symptoms and keeping inflammation down. Lemon Balm Tea- When you have a tea with lemon balm you can help soothe headaches and reduce inflammation in the airways, so you can breathe easier. Turmeric Tea- As mentioned before, turmeric is said to be an herb with healing powers and when it is used in a tasty Turmeric tea, it can be used to not just fight the symptoms of allergies, but if used regularly, it can be used to prevent the symptoms before they have a chance to start. Before allergy season begins, it’s a good idea to have a plan of action in place to combat the possibility of allergies taking over and causing you to feel miserable all season long. Nothing beats a good long hike through the woods or even opening your windows to air the house out without the worry of pollen and other irritants causing sneezing, coughing and other allergy symptoms. With natural herbs and teas, you can now find allergy relief in a safe and healthy way. Affordable Medical Devices For Safety and Comfort! 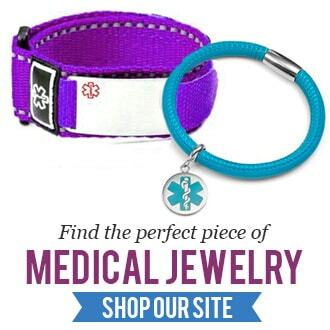 Pretty Medical ID Bracelets for Women to Glam it Up!